Are you looking for a new mattress but trying to save some money? Trying to find a quality option that won’t break the bank, but still has the support and comfort you need? Then we may be able to help. 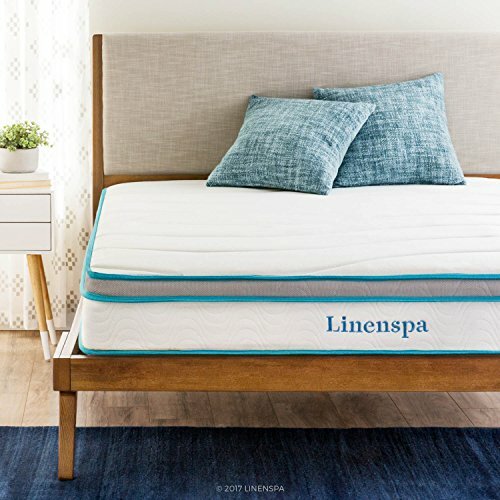 Our favorite mattress for budget shoppers is the LINENSPA Memory Foam Innerspring mattress, which combines foam and coils for plush durability. Our runner-up choice is the Casper mattress which, although more expensive than the others on the list, makes up for it with its quality materials, warranty, and zoned back support. Mattresses are never a small or uninvolved purchase. They’re something you should choose carefully and will likely spend a fair amount on (even if you choose a budget model). In the competitive mattress market, you can find options for a few hundred dollars up to the thousands. In this article, we’ll cover five top options in the lower end of the budget spectrum, so you can find the right choice for you. Shopping for anything online can seem overwhelming with the amount of information there is on the internet. And with a purchase that’s as important as your mattress, making the right choice is key. We scoured the web to find the best mattresses for people on a budget and will follow this information up with what to consider while shopping, frequently asked questions, and more. The DynastyMattress Cool Breeze bed is a memory foam mattress with cooling gel that keeps the sleeper from overheating. Since maintaining a comfortable sleep temperature is important for quality rest, people who often wake up sweaty should do well with a bed like this. The Cool Breeze mattress is made with four layers of comfortable, durable foam. If you’re craving pressure relief and like the slow-responding feel of memory foam, this budget-friendly mattress could be a good choice. It has a medium-firm feel that should suit most body types and sleep positions and will absorb motion better than an innerspring mattress. Motion absorption makes a bed good for couples or people with pets since movements on the mattress won’t travel through the bed and disturb you as you sleep. The cover on the Cool Breeze mattress is luxurious and can be unzipped and taken off to wash. The DynastyMattress Cool Breeze bed comes with two free gel memory foam pillows as an extra bonus. It also comes with a 120-night sleep trial and a 30-year warranty. This mattress costs $389 for a Queen size. The LINENSPA Memory Foam Innerspring mattress is an 8-inch bed that uses both memory foam and an innerspring layer to create a medium-firm sleep surface. The soft, knit cover has a layer of memory foam stitched into it for extra comfort and the comfort layer of the bed is made from conforming foam to minimize pressure points. Under the foam top, there’s a layer of steel coils for durability and support. This layer provides some bounce and also encourages air to flow through the mattress, dispersing heat and helping you rest comfortably. Note that this bed comes rolled up and compressed in a box, so it will need some time to expand to its full size after it’s delivered. The LINENSPA Memory Foam Innerspring mattress comes with a 10-year manufacturer’s warranty. 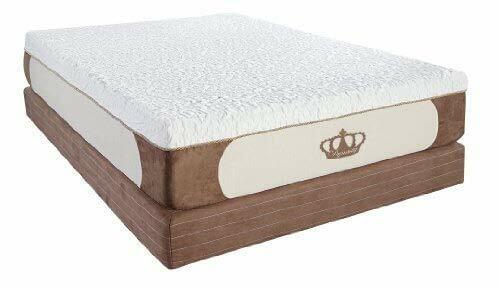 It is very affordable, especially for its high number of positive reviews and is only $182.99 for a Queen size. The Zinus Memory Foam Green Tea Mattress is an all-foam bed that couples may find especially suitable since it absorbs motion well. Although it does come with an initial off-gassing smell, Zinus has infused this mattress with green tea extract to help cover it up, and the smell dissipates after a week or so. The bed has conforming top layers for comfort and a dense foam base. The bed comes shipped in a box right to your door and should be given at least 72 hours to expand to its full size. It may take a bit longer than this in colder weather, so keep that in mind. This 12-inch mattress is designed to provide comfort and pressure relief for people on a strict budget. It comes with a 10-year warranty and is around $250 for a Queen size. 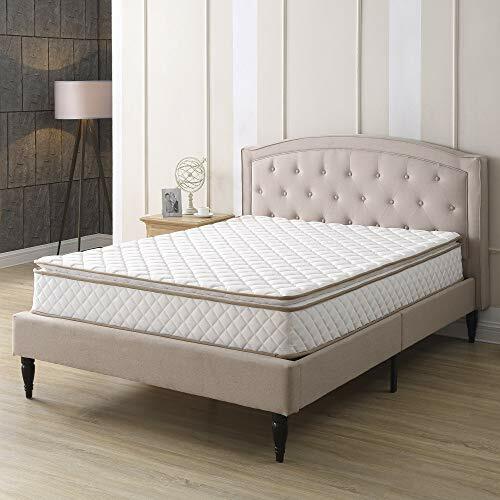 The Classic Brands Mattress is an affordable mattress that uses both memory foam and coils in its construction. Since sleepers who carry some extra weight could use additional support in their bed, a mattress with a layer of innerspring coils could be a good choice. The knit pillow top cover on this bed has a layer of comfort foam for a plush feel, followed by a comfort foam layer for pressure relief. The coils in the Classic Brands Mattress are individually wrapped to prevent motion transfer and conform to your unique body shape. This mattress is medium-firm, which means it should comfortably support every sleep position. 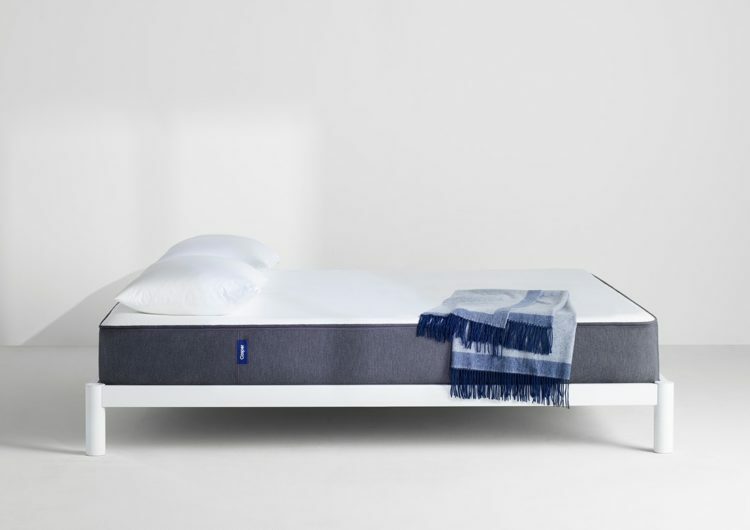 The Class Brands Mattress comes compressed in a box and may require a day or two to expand to its true size. It comes with a 10-year manufacturer’s warranty and is currently under $200 for a Queen size if you buy the 2017 model. The Casper mattress is an all-foam bed that people with back pain should appreciate. It uses a zoned support system with a firmer section under your hips and a softer section under your shoulders. This zoned layout helps promote a neutral position for your spine, potentially easing pain or tension in the back. Unlike other all-foam beds, the Casper mattress doesn’t retain heat to an uncomfortable degree. This bed is made with an open-cell foam, which promotes airflow to keep you cool while you rest. The Casper mattress is suitable for all sleep positions but back sleepers should find its zoned support extra comfortable. While other foam beds create a sinking or cradling feeling, the Casper mattress has a more responsive feel that makes it easy to move around on. You won’t feel stuck in this bed like some people experience with memory foam and instead will sleep on top of it. The Casper mattress comes with a 100-night sleep trial and currently costs $995 for a Queen. The feel of your mattress refers to how firm or soft it feels. Ideally, you’ll already have an idea of whether you prefer a soft or firm mattress. Soft beds are suitable for people who sleep exclusively on their side since the plush surface can comfortably support the hips and shoulders in this position. Firmer beds are a good option for stomach and back sleepers as they promote spinal alignment by keeping the hips properly supported. Medium-firm beds are the best for the widest variety of people and sleep positions. If you’re ordering a mattress online and don’t know what feel or firmness you prefer, medium-firm is the safest bet. When it comes to mattresses, support is a bed’s ability to keep your body in alignment. This means your spine can maintain its natural, neutral curve and your pelvis doesn’t sink too far into the bed. The best way to tell whether a bed will provide you with the support you need is to test it out for yourself. Most average or heavy-weight sleepers will find that an extra soft bed has too much sinkage in the pelvis and a medium-firm bed will likely work better. In order to get the support you need, you should get a medium-firm or firm mattress. How much you weigh will also determine the type of mattress you should pick. If you don’t weigh much, a soft bed could provide you with the support you need, as you won’t sink too far into it, which can cause misalignment for heavier people. People of average weight can more or less take their pick with mattress type since most beds are made for this weight range. Heavy sleepers, on the other hand, should opt for either a firm mattress or a bed with an innerspring layer to ensure they’re getting the support they need. Unfortunately, if you choose a mattress based on price alone, it probably won’t last as long as a more expensive one. When it comes to durability and quality, you’ll want to look at the materials used in the mattress. Beds with multiple layers and a variety of materials tend to be more resilient, as there are more layers that have to deteriorate before the bed wears out. Try to choose a bed with a durable, dense base, as this will help the mattress maintain its shape over time. And if you’re curious about the expected lifespan of a particular mattress model, you can check out user reviews and see what customers are reporting as far as durability. Responsiveness refers to how a mattress reacts to pressure. Slow-responding beds, like memory foam, don’t have any “push back” and tend to create a slow, melting sensation. Responsive beds, on the other hand, have a bouncy feel and don’t create much sinkage, so that you feel like you’re sleeping on top of the mattress rather than in it. Innerspring or latex mattresses tend to be most responsive, although hybrids (which use both coils and foam or latex) can also be responsive, depending on what their top layers are made of. The amount of bounce you want in your bed is a matter of personal preference, although people who move around a lot in their sleep will likely do better with a more responsive bed than a non-responsive one. A bit of bounce makes it easier to reposition yourself in the night and also prevents you from feeling stuck in your bed. Most mattresses are less supportive on the edges than they are in the center, although some manufacturers specifically reinforce these areas to combat that issue. Edge support only matters for some people. If you’re older or have mobility issues (like arthritis) that make it tough to get out of bed in the morning, strong edge support is important. People who share their bed with a partner and like to be able to spread out without feeling like they’re going to fall off the bed should also appreciate strong edges. Typically, innerspring mattresses have stronger edges than foam beds. Some people naturally sleep hotter than others and wake up sweaty in the night. Certain types of mattresses tend to retain heat more than others (like memory foam, for example). Beds with coils tend to promote airflow due to the space between the springs. If you’re a hot sleeper and do choose a foam mattress for comfort and pressure-relief, try to find one that has cooling technology. 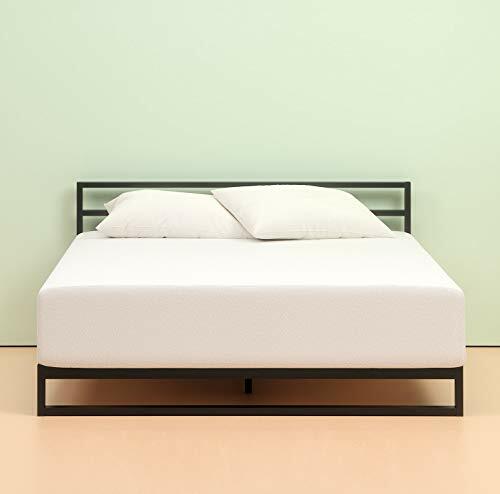 Open-cell foam, gel or copper infusion, and breathable covers are all effective cooling technology to look for when choosing a mattress if you tend to overheat. Off-gassing is a chemical smell that you may notice when you first un-package a new mattress, especially if it came compressed in a box. For people who are very sensitive to odors, this can be bothersome. However, most off-gassing smells will dissipate within a few days if you keep the mattress in a well-ventilated room. Your mattress is a very important investment, which is why checking into the manufacturer’s warranty is a good idea before your purchase. A quality warranty will ensure that you’re protected in case there’s a manufacturing defect. Check for this information on the product page and, if it’s not there, contact the seller directly for more information. When it comes to buying a new bed, there are a few factors to keep in mind. Let’s go over some frequently asked questions about mattresses. Q: Can choosing the right mattress help with my back pain? A: Although it’s certainly no substitute for a doctor visit, a good mattress can help with your back pain. Quality rest helps your body recover and heal faster, so choosing the right bed for you can certainly make a difference. The type of mattress that will be most suitable for your pain will depend on your personal comfort preferences. Do you prefer a deep “hug” feeling from your bed? If so, you may want to opt for a pressure-relieving memory foam mattress. If you want a firmer, bouncy bed, an innerspring bed could give your body the support you need and potentially ease your tension or pain. Q: How often should I buy a new mattress? A: As a general rule, mattresses don’t tend to last longer than about seven to 10 years. However, the easiest way to tell whether it’s time for an upgrade is noticing how you feel when you wake up. If your mattress is worn out, it may be sagging in the middle, causing an achy lower back. Or you might be waking up with allergies from dust mites in the bed, which can happen with older mattresses. If you visit a hotel and wake up feeling better than you do after sleeping in your own bed at home, this is another good indication that it’s time to shop for a new bed. Q: What features make a bed good for couples? A: Do you share your bed with a partner? If so, then there are special considerations to make if you want to get the best night’s sleep possible. The first is motion absorption. Motion absorption refers to how good your mattress is at isolating movements in the mattress. If you’ve ever shared a bed with poor motion isolation with a partner, you were probably woken up every time they shifted in their sleep. Foam beds are best at absorbing motion due to their consistency, whereas innerspring beds don’t isolate movements as well. 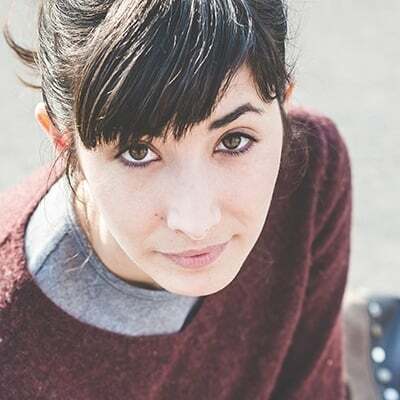 The second factor to consider is noise, especially if you or your partner is a light sleeper. Foam or latex beds are silent, whereas spring beds can make creaking sounds when you move on them. Try to find a silent bed so you and your partner don’t wake each other up throughout the night. You don’t have to sacrifice quality to get an affordable mattress. Our top budget mattress pick is the LINENSPA Innerspring Memory Foam mattress, which provides the durable support of coils with pressure-relieving foam.